The world of Youtube covers can be a treacherous territory filled with nose flutes, marginal talent and the occasional treadmill drum cover. 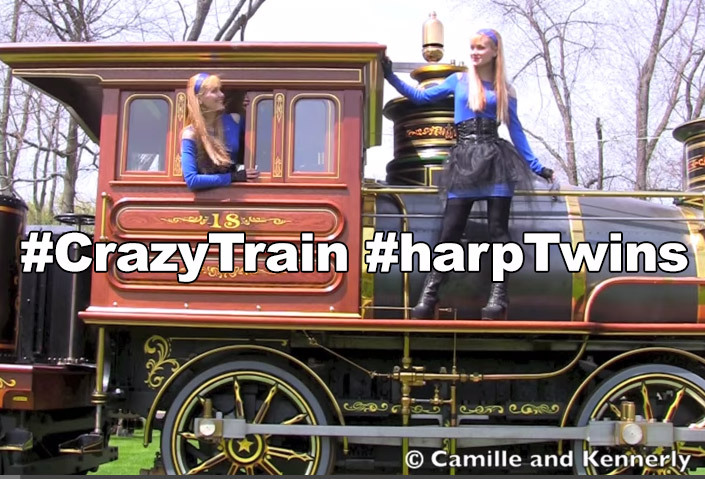 Today we have a clip from the softer side courtesy of Chicago based harpists Camille & Kennerly (aka the Harp Twins), who have taken it upon themselves to rework Ozzy Osboune‘s classic from the Blizzard of Oz – Crazy Train. The hook of this track is forever scarred into my mind so I can’t listen objectively to it. It all stems back to a nasty 12 girl amateur stripping competition I once witnessed at the Zoo in Winnipeg. Even when it is played sweetly on a harp by two beautiful blonde women, my mind is left to wander into the pink eye tinged memories of that nastyhot dog eating / stripping competition evening. Thus, I’ve rated this track low due mainly to my own bad memories and the fact that it sounds like elevator music. I’ll admit that they receive some bonus points for the matching outfits and you can’t deny the years of practice it must take to get this good at an antiquated instrument, but yeessh…. no thanks. If you happen to be be digging their vibe, they have done quite a few videos. Their cover of Fear of the Dark by Iron Maiden is pretty decent and they of course do a Lady Gaga number. Let me know what you think of this shi~ in the comments below. Summary: While technically perfect, this version of Crazy Train is more likely to be played at a funeral than a rock arena.